If your eyes become irritated from dust or other foreign particles, rubbing your eyes could grind the irritant deeper and possibly scratch your eye. Tears are your best best to wash the speck out, or an eyewash to help flush stuff away. It’s never a good idea to look directly at the sun. More so, the sun’s UV rays can bounce off reflective surfaces like snow, water, sand, etc. A common injury from sun exposure is snow blindness or photokeratitis which is a painful, temporary loss of vision when your overexposed to UV rays. Essentially, a sunburned eye. 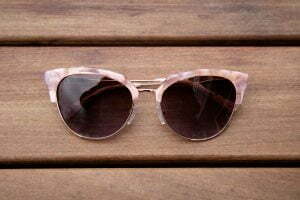 Make sure you have sunglasses that block 100% of UV rays to add a protective barrier from your eyes and the sun. Everyday cleaners we use contain a various amount of chemicals that are incredibly dangerous for your eyes. 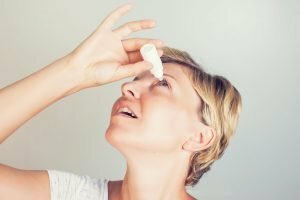 Accidental splashes may happen, but if you get any amount of chemical in the eye flush it with water immediately for at least 15-20 minutes. To be safe, call your eye doctor or the ER to see if more steps should be taken. The more acidic or basic (alkali) a chemical, the more damage it can cause so make sure you head to the ER immediately after flushing to prevent permanent damage. Wearing goggles when cleaning decreases your eye exposure to dangerous chemicals. In most cases, black eyes are just like any other bruises and shouldn’t be a big concern. Save the steak for dinner, there’s no science to back up this treatment and the bacteria from the raw meat could cause an infection. Yuck! Applying a bag of frozen peas as soon as possible in 15-20 minute increments will help with swelling at first. After a day or two a warm compress will help increase blood flow to the area. The best rule of thumb when it comes to eye care is to check in with yourself often. See if your black eye bruising and pain subsides or increases. Calling your doctor for advice is never a bad thing. If you’re doing yard work that involves a mower, leaf-blower or other power tools, protective eye wear is the best way to keep debris from flying into or puncturing your eyes. 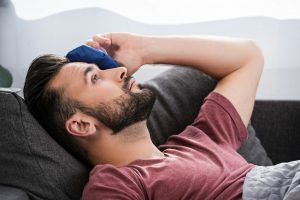 According to a survey by the Bureau of Labor Statistics, 94% of worker eye injuries resulted from objects or chemicals getting around their eye wear. Protective eye wear should have snug, wrap around style to prevent particles from getting behind the lens. Check out the comfortable, OSHA and ANSI Z87.1 compliant prescription glasses that Dr. Tavel offers here. If you do get a cut or puncture, tape a paper cup over the eye to protect the eye until you get to the doctor. Trying to remove any object yourself can be dangerous. Leave that to a professional. To decrease your chance of certain eye injuries, always remember that safety glasses, sports eye wear or protective face shields will always be the best defense in protecting your eyes during risky activities. Being prepared can help you see clearly for whatever life throws at you.